Handcrafted Metal makes custom metal countertops, metal bar tops and kitchen metal counter tops in variety of metals that create a focal point in your home or business. We build metal countertop in various metals to accommodate your kitchen and your taste. For warm brown color tones we offer copper, brass, and bronze metal countertops. For silvery tones with sparkle we make stainless steel metal countertops, while our pewter, zinc, and steel metal counter tops offer a variety of neutral gray tones. We use only the highest-quality materials, so our metal countertops are very durable. Also, our welded integral sinks have coved corners for easy cleaning, and our custom integral drainboards put you in control of water. We can even make the corners of integral sinks have an exact radius to perfectly match the sink cutout in metal countertop for your kitchen! We will work with you to make a superior custom metal countertop for your kitchen. Our hammered metal bar tops are our specialty. Start out by choosing a metal type on this page, then browse our galleries, pick any of our metal countertop, and click Customize to enter the dimensions you need and get an instant price. We make copper metal countertops that accommodate your kitchen and your taste. We can customize metal kitchen counter to your specifications that exceed your expectations! Our metal countertop and kitchen islands tops are designed to follow the shape of your kitchen. Handcrafted Metal pewter metal countertops makes a powerful presence in your kitchen. During our 25 years of success, We have learned to make metal countertops from a variety of materials. We can build metal countertop and metal bartop, for any kind of specifications and customize it to any requirement. Each bronze metal countertop is fully welded and polished, and made with the purest bronze metal available.You can choose how your custom metal countertop will look, by combining our custom features into the perfect metal countertop in bronze for your kitchen. Handcrafted Metal customized zinc metal countertops and zinc metal islands for every kitchen. Pick from our broad selection of edges and hammered textures to fit your style. 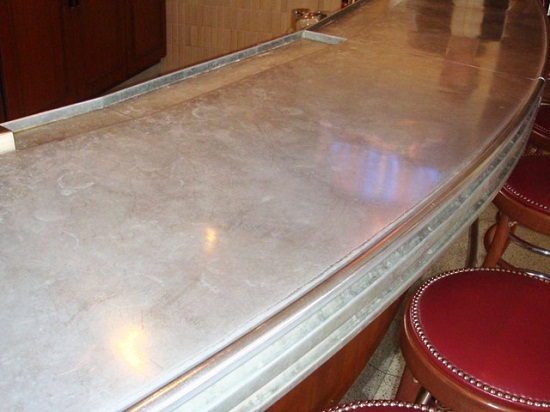 Straight, simple channel edges provide a modern touch to your zinc metal counters and bar tops. Rounded edges bring a hint of the early 20th century. Choose a metal above to see the many welded, seamless metal Countertops and Metal Bar Tops, shapes and styles that we have built in your selected metal. We can build any combination of style, finish, and features. Our wide variety of styles and textures can be applied to any metal Countertop style. Our Hammered metal countertops are very popular with our customers. Feel free to innovate and make new combinations of Custom metal kitchen Counters as well. Our Stainless Steel metal countertops for your kitchen offer cool silvery gray colors in straight modern designs and graceful curved shapes. Our stainless steel finishes include matte, grain, semi-gloss, and mirror. Handcrafted Metal Zinc custom metal bar tops and metal countertop colors extend from chalky natural light gray through our wonderful medium gray patina to fabulous rich dark grays. Our Metal Countertops in Zinc can have smooth, distressed,or hammered textures. For colors with red and brown tones, Copper offer from natural pink all the way to dark warm brown espresso, and many bright colors in between, with textures from smooth to hammer. Hammered Metal Countertops in copper are our specialty. Our Brass and Bronze Metal Countertop present uniquely golden yellow colors that are free of red tones, with colors ranging from rich gold to dark gray brown to oil rubbed blue black tones. Patina pattern can be solid, mottled, or grained. For silver colors with subtle warm undertones our Pewter Metal Countertops provide sublime neutral tones. We can apply matte, semi-gloss, and mirror finish on pewter metal countertops, and smooth, distressed, and hammered textures for additional character. 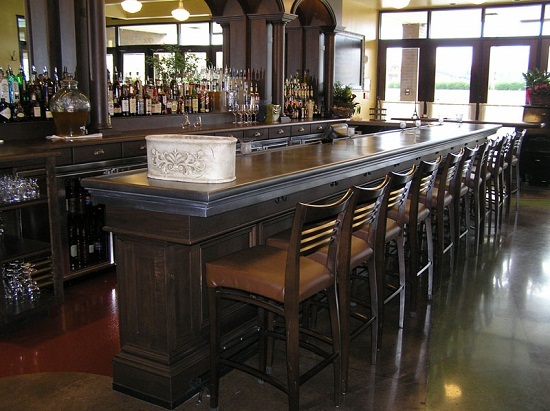 Handcrafted Metal has built thousands of Customized metal countertops and Metal bar tops. The vast array of styles, finishes, textures, and metals available with Handcrafted Metal provides unlimited choices. Handcrafted Metal takes pride in its very high quality craftsmanship. We see your custom metal countertop order as an opportunity to deliver our uncompromising design and craftsmanship. You can see that we offer a large number and an amazing variety of countertops and bar tops designs in variety of metal. Our long experience building customized Metal Countertops in every size, shape, and color gives us mastery of the essential methods , processes , and skills needed to produce a metal countertop that exceeds your expectations. We offer an extensive selection of Kitchen metal Counters styles in every metal category. Just browse the metal and then click the Style to see hundreds of different custom kitchen metal countertops products. We are glad to answer any questions about any of our Metal Kitchen Counter tops for your kitchen. Call 1-800-755-0310 to speak with a product specialist who will help you select and configure your ideal metal kitchen counter top. Handcrafted Metal Kitchen Counter tops are built in a way to be the focal point of your kitchen or Bar.